Our 'home away from home' is located at the southern tip of Hilton Head Island, in a quiet neighborhood of Sea Pines Plantation. Sea Pines is the Island's largest resort and is skirted by 5 miles of beautiful beaches and contains acres of forest preserves and miles of bike trails. Sea Pines hosts the PGA Tour's Heritage of Golf tournament every year in April. Our home is conveniently located for that perfect vacation get-away. A short bike ride (one mile) takes you to Harbour Town Golf Links, the Harbour Town Yacht Club, or Sea Pines beaches (two miles). This allows visitors to be near it all yet be able to retreat back to a quiet private neighborhood home to relax. The home offers a panoramic lagoon view with deck access from the master bedroom, great room, and kitchen. It is tastefully decorated with tradtional furnishings. There is a private community swimming pool and tennis courts available for use (located only a 2 minute walk away!). We take great pride in updating our home and adding new amenities each year for our guests enjoyment. There is nothing worse than renting a vacation home and being disappointed. We use VRBO ourselves when we vacation so we truly understand the importance of making a good impression and exceeding expectations. Our goal is to make sure you enjoy our home as much as we do! We are the Gugle family from Waxhaw, North Carolina, which is located close to Charlotte. My wife and I have four children, ages ranging from 17 to 12 years old and they all love Hilton Head! We have been big fans of Hilton Head for many years. We were married in Hilton Head in 1994. My wife's parents live year round in Hilton Head. We bought our home in 1999 because we wanted a vacation property located near family. When we first saw our home, we absolutely fell in love with the breathtaking water view from the back deck and how bright and airy it is inside. The tranquility of the scenery captured us at first and with each passing season we gain a greater appreciation for the natural setting and wildlife. Our home is an oasis of natural beauty and peacefulness in an otherwise busy community (Sea Pines). We like the fact that you can get away from the crowds and have your own slice of peace and quiet even when it is crowded in the summer. We have a private community pool and tennis courts a short distance from our home. We can walk (20 min) to the Harbor Town Lighthouse and the marina. We have shopping and restaurants located within one mile. Our home gives us and our guests a place to get away from it all and yet be close enough to everything you need. Unlimited local and domestic long distance. International calls are blocked. High efficiency GE washer and dryer. GE dishwasher with stainless steel exterior. In Summer 2016 we installed a new Kenmore 27 cubic foot fridge with stainless steel exterior. It is the highest rated refrigerator according to Consumer Reports. In Spring 2018 we installed a new, top of the line oven/range with stainless steel exterior. We added a new dining table and chairs in 2016. New 60' LCD TV added in 2015. As a benefit to our guests, we have arranged a discount on bicycle rentals from Riding Tigers Bike Rentals to obtain discounted pricing on bike rentals for our guests. Simply call 843-686-5833. Private community hardcourt tennis courts available for your use. Within 5 minutes on foot - located about 3 houses down the street. Outdoor pool - not heated. Loved this house, so light and spacious , delightful spot on the lagoon and very convenient for Harbour Town . Very well equipped and comfortable . The home was spacious, neat , clean & comfortable. The large outdoor deck with wonderful view was so relaxing and peaceful. I would definitely rent this home again in a heartbeat! We really enjoyed this home. The views all throughout the house were amazing. Location is great as well! Very easy bike ride to Harbour Town. Beautiful home, beautiful view & most attentive & terrific owners! We had a wonderful week in this very comfortable home. 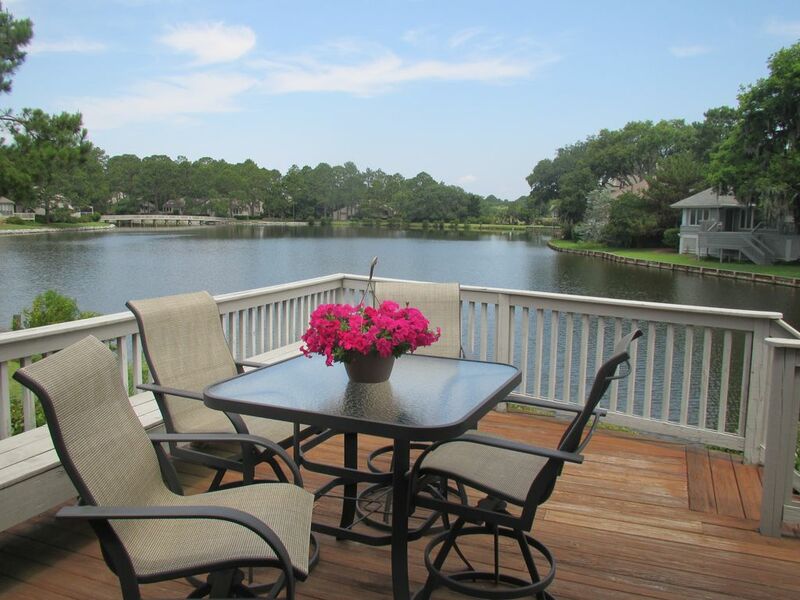 Beautiful view of the lagoon, comfortable furniture and beds, and bikes available for riding the Sea Pines trails. The owners were very responsive and committed to a first-rate experience, including leaving a bottle of wine as welcome gift. We will definitely be back! Incredible view! Beautiful home! Loved every minute of our stay! We had a wonderful time and truly enjoyed our stay at this beautiful house. We had a little snafu with the cable and one text message immediately had the owners father-in-law at our door. We really enjoyed our chats with him and he stayed here until we resolved the problem. The kitchen was fully stocked with everything we needed to cook which made cooking so easy. We definitely plan to return to Sea Pines in the future.